Smoke and Mirrors: Poverty is a Criminal Offense Even Punishable by Death. Poverty is a Criminal Offense Even Punishable by Death. Even though corporate profits have soared to record levels in recent years and the 1% continue to line their already lined pockets, most Americans are still struggling; there has been no economic recovery for the 99%. However, the "recovered" wealthy politically connected class has thoroughly convinced the waning middle-class to hate the poor, an ongoing effort since 1980. They tell the middle class, "Look how much it costs you to provide food stamps, welfare benefits, etc., to the poor," covering up the fact that they are the ones plundering all of the wealth, and effectively keeping the 99% at each others throats, therefore blind to the truth. The mainstream media ensures that most of us stay blinded to that truth by continuously droning on and on about this "economic recovery" when, in actuality, median household income is actually 4.4 % lower than it was when the last recession officially "ended". Economic recovery? How can that be when over 100 million American citizens are on welfare? But despite the growing inequality between rich and poor, too many Americans still support the policies that deny basic humanitarian aid to our nation's poor, a population that's growing by leaps and bounds. So it is, in the richest nation in the world, millions of people are out of work--or underemployed--homeless, and hungry, as it becomes increasingly commonplace to criminalize homelessness, not to mention, the act of helping the homeless. Those who dare to go out into the community to bring food and supplies are finding themselves arrested at an alarming rate. Yet, how does one get a job once you no longer have a home address, phone number, bus fare? If you become too ill to work? 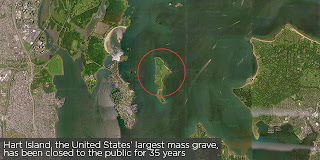 Did you ever hear of Hart Island? No? Well, you're not alone. 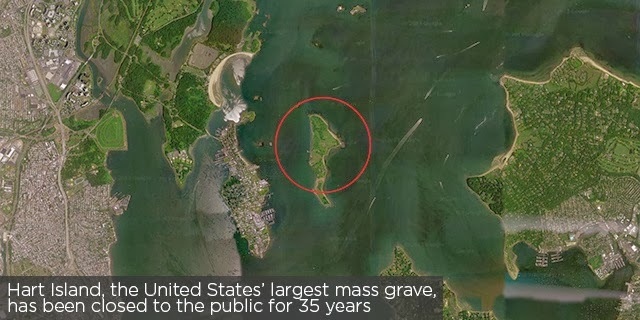 Hart Island is "a thin, half-mile long blip of land at the yawning mouth of Long Island Sound, just across the water from City Island in the Bronx" and is the largest publicly-funded mass grave site in the U.S. which has been closed to the general public for the last 35 years. Almost one million unclaimed/unknown dead, mostly homeless, are buried there. Loved ones are prevented from freely visiting these almost impossible-to-find grave sites. In Arpil of this year, an online searchable database of burial records was set up, however, access is limited to a small gazebo near the dock, rather than any of the actual burial sites. “Its most important role has been to serve as what’s known as a potter’s field, a common gravesite for the city’s unknown dead. Some 900,000 New Yorkers (or adopted New Yorkers) are buried here; hauntingly, the majority are interred by prisoners from Riker’s Island who earn 50 cents an hour digging gravesites and stacking simple wooden boxes in groups of 150 adults and 1,000 infants. These inmates—most of them very young, serving out short sentences—are responsible for building the only memorials on Hart Island: Handmade crosses made of twigs and small offerings of fruit and candy left behind when a grave is finished." Moreover, 41 states have debtors' prisons. Even though the U.S. officially made debtors' prisons illegal in the 1830s, you can still be jailed for showing "contempt of court" during a creditor lawsuit. In Ohio they're throwing people into jail for as little as $300! That's right, in Huron County, "more than one in every five of all bookings...involved a failure to pay fines." Cities' homeless crackdown: Could it be compassion fatigue? Bloomberg Strikes Again: NYC Bans Food Donations to the Homeless. Why the Rich Don't Give to Charity The wealthiest Americans donate 1.3 percent of their income; the poorest, 3.2 percent. What's up with that? Why Do the Rich Give Less than the Poor? A mother loses her job, a father is kept from working by an injury, a family is forced from their home by fire or natural disaster. 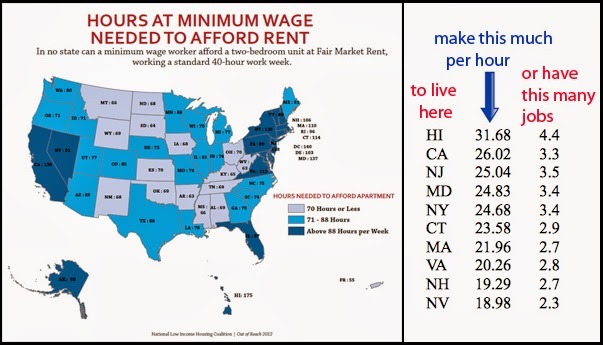 Healthcare costs soar, public transportation is underfunded, affordable housing is almost impossible to find. These are the reasons why families now make up 40 percent of the homeless population, and why one out of every four homeless people is a child. In response to this crisis, the Interfaith Hospitality Network brings the faith community together to help families regain their housing, their independence, and their dignity. IHN is a partnership of congregations within a community helping families who are facing homelessness. It offers an opportunity for volunteers of all faiths to reduce homelessness and transform lives. Interfaith Hospitality Networks are currently operating in 41 states and the District of Columbia, in large cities, suburbs, and rural counties. They mobilize community resources: houses of worship for lodging, congregations for volunteers, social service agencies for assessment and referrals, and existing facilities for day programs. This strategy enables networks to help homeless families achieve lasting independence at a third of the cost of traditional shelters.